Heartbleed Hask: The Passwords You Need Change ASAP. The critical “Heartbleed” bug reported earlier this week to have affected the security of most of the internet was discovered by researchers at the United States National Security Agency two years earlier, according to a new report. On Friday afternoon, Bloomberg News journalist Michael Riley reported that the NSA knew about the monstrous flaw for at least two years ahead of this week’s announcement, but kept it hidden from technologists and instead exploited it to hack the computers and correspondence of certain intelligence targets. What and When Did NSA Know About Heartbleed Bug? IF you use any of those sites change your password ASAP. Do you need to change your password? Twitter No Yes Unclear Twitter wrote that OpenSSL “is widely used across the internet and at Twitter. We were able to determine that [our] servers were not affected by this vulnerability. We are continuing to monitor the situation.” While reiterating that they were unaffected, Twitter told Mashable that they did apply a patch. Google Yes Yes Yes Yes* “We have assessed the SSL vulnerability and applied patches to key Google services.” Search, Gmail, YouTube, Wallet, Play, Apps and App Engine were affected; Google Chrome and Chrome OS were not. *Google said users do not need to change their passwords, but because of the previous vulnerability, better safe than sorry. Microsoft No No No Microsoft services were not running OpenSSL, according to LastPass. Yahoo Yes Yes Yes Yes “As soon as we became aware of the issue, we began working to fix it… and we are working to implement the fix across the rest of our sites right now.” Yahoo Homepage, Yahoo Search, Yahoo Mail, Yahoo Finance, Yahoo Sports, Yahoo Food, Yahoo Tech, Flickr and Tumblr were patched. More patches to come, Yahoo says. AOL No No No AOL told Mashable it was not running the vulnerable version of the software. Hotmail / Outlook No No No Microsoft services were not running OpenSSL, according to LastPass. Amazon Web Services (for website operators) Yes Yes Yes Yes Most services were unaffected or Amazon was already able to apply mitigations (see advisory note here). Elastic Load Balancing, Amazon EC2, Amazon Linux AMI, Red Hat Enterprise Linux, Ubuntu, AWS OpsWorks, AWS Elastic Beanstalk and Amazon CloudFront were patched. Etsy Yes* Yes Yes Yes Etsy said that only a small part of its infrastructure was vulnerable, and they have patched it. Hulu No No No No comment provided. SoundCloud Yes Yes Yes Yes SoundCloud emphasized that there were no indications of any foul play and that the company’s actions were simply precautionary. All the banks we contacted (see below) said they were unaffected by Heartbleed, but U.S. regulators have warned banks to patch their systems. Barclays No No No No comment provided. E*Trade No No No E*Trade is still investigating. Wells Fargo No No No No reason provided. Intuit (TurboTax) No No No Turbotax wrote that “engineers have verified TurboTax is not affected by Heartbleed.” The company has issued new certificates anyway, and said it’s not “proactively advising” users to change their passwords. IFTTT Yes Yes Yes Yes IFTTT emailed all its users and logged them out, prompting them to change their password on the site. Spark Networks (JDate, Christian Mingle) No No No Sites do not use OpenSSL. 1Password No No No 1Password said in a blog post that its technology “is not built upon SSL/TLS in general, and not upon OpenSSL in particular.” So users don’t need to change their master password. Dashlane Yes Yes No Dashlane said in a blog post users’ accounts were not impacted and the master password is safe as it is never transmitted. The site does use OpenSSL when syncing data with its servers but Dashlane said it has patched the bug, issued new SSL certificates and revoked previous ones. LastPass Yes Yes No “Though LastPass employs OpenSSL, we have multiple layers of encryption to protect our users and never have access to those encryption keys.” Users don’t need to change their master passwords because they’re never sent to the server. But passwords for other sites stored in LastPass might need to be changed. How SOPA would affect you? The Stop Online Piracy Act (SOPA), also known as House Bill 3261 or H.R. 3261, is a bill that was introduced in the United States House of Representatives on October 26, 2011, by House Judiciary Committee Chair Representative Lamar S. Smith (R-TX) and a bipartisan group of 12 initial co-sponsors. The bill, if made law, would expand the ability of U.S. law enforcement and copyright holders to fight online trafficking in copyrighted intellectual property and counterfeit goods. Presented to the House Judiciary Committee, it builds on the similar PRO-IP Act of 2008 and the corresponding Senate bill, the PROTECT IP Act. The originally proposed bill would allow the U.S. Department of Justice, as well as copyright holders, to seek court orders against websites accused of enabling or facilitating copyright infringement. Depending on who makes the request, the court order could include barring online advertising networks and payment facilitators from doing business with the allegedly infringing website, barring search engines from linking to such sites, and requiring Internet service providers to block access to such sites. The bill would make unauthorized streaming of copyrighted content a crime, with a maximum penalty of five years in prison for ten such infringements within six months. The bill also gives immunity to Internet services that voluntarily take action against websites dedicated to infringement, while making liable for damages any copyright holder who knowingly misrepresents that a website is dedicated to infringement. How PROTECT IP Act would affect you? The PROTECT IP Act (Preventing Real Online Threats to Economic Creativity and Theft of Intellectual Property Act of 2011 or PIPA), also known as Senate Bill 968 or S. 968, is a proposed law with the stated goal of giving the US government and copyright holders additional tools to curb access to “rogue websites dedicated to infringing or counterfeit goods”, especially those registered outside the U.S. The bill was introduced on May 12, 2011, by Senator Patrick Leahy (D-VT) and 11 bipartisan co-sponsors. The Congressional Budget Office estimated that implementation of the bill would cost the federal government $47 million through 2016, to cover enforcement costs and the hiring and training of 22 new special agents and 26 support staff. The Senate Judiciary Committee passed the bill, but Senator Ron Wyden (D-OR) placed a hold on it. How PIPA would affect you? The bill says that it does not alter existing substantive trademark or copyright law. The bill provides for “enhancing enforcement against rogue websites operated and registered overseas” and authorizes the United States Department of Justice to seek a court order in rem against websites dedicated to infringing activities, if through due diligence, an individual owner or operator cannot be located. The bill requires the Attorney General to serve notice to the defendant. Once the court issues an order, it could be served on financial transaction providers, Internet advertising services, Internet service providers, and information location tools to require them to stop financial transactions with the rogue site and remove links to it. The term “information location tool” is borrowed from the Digital Millennium Copyright Act and is understood to refer to search engines but could cover other sites that link to content. What people are saying about about SOPA and PIPA? Members of Congress are trying to do the right thing by going after pirates and counterfeiters but SOPA and PIPA are the wrong way to do it. The U.S. http://youtu.be/Qcbg29Q0DhAgovernment could order the blocking of sites using methods similar to those employed by China. Among other things, search engines could be forced to delete entire websites from their search results. That’s why 41 human rights organizations and 110 prominent law professors have expressed grave concerns about the bills. Law-abiding U.S. internet companies would have to monitor everything users link to or upload or face the risk of time-consuming litigation. That’s why AOL, EBay, Facebook, Google, LinkedIn, Mozilla, Twitter, Yahoo and Zynga wrote a letter to Congress saying these bills “pose a serious risk to our industry’s continued track record of innovation and job-creation.” It’s also why 55 of America’s most successful venture capitalists expressed concern that PIPA “would stifle investment in Internet services, throttle innovation, and hurt American competitiveness”. More than 204 entrepreneurs told Congress that PIPA and SOPA would “hurt economic growth and chill innovation”. When I found out Fight for the Future needed help with their campaign against a new bill called PROTECT-IP, I had to take a little time away from Everything is a Remix Part 4 and produce the video above. 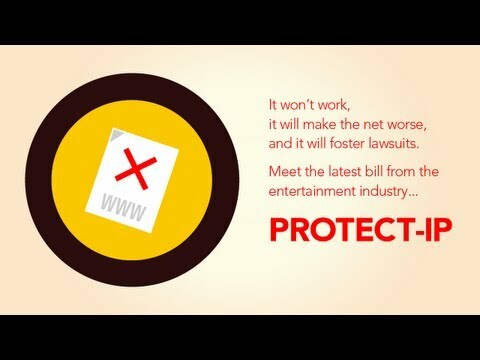 PROTECT-IP is the latest piece of legislation aiming to chip away at your online rights in the name of protecting the entertainment industry’s business model. It’s legislation that won’t work, will give us yet more lawsuits, and will make the net worse. Whether you lean right and hate business regulation, lean left and hate censorship, or lean neither way but hate useless legislation, PROTECT-IP is a bill everyone should oppose. I encourage you to head over to Fight For the Future and contact congress. So, it is up to you to decide support it or not. The Internet is a thriving ecosystem that powers our economy and our society. PIPA and SOPA threaten the web.